We know tech giants like Apple and Facebook make money by truckloads, and each of their quarterly reports prove it. But since all we see is huge numbers, it’s hard to put all of those billions of dollars into perspective. But thanks to a website designed by web developer Neal Agarwal (@nealagarwal), we can visualize exactly how much those tech companies earn every singe seconds. The website, everysecond.io, not only shows the amount of revenue and profit earned per second, but you can also watch how much device (iPhone, iPad, Watch) the company sells per second. 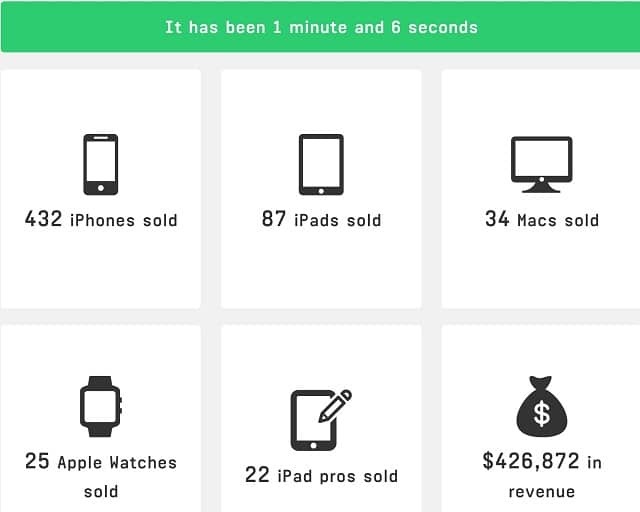 As you can visualize from the site, Apple approximately sells 432 iPhones, 87 iPads, 34 Macs, 25 Apple Watches, and 22 iPad Pros within a minute, which generates about $426,872 in revenue. This is not just about Apple. The website also has visualized earnings for Facebook and YouTube. As the data suggests, Facebook approximately earns $50,000 per minute in revenue. As for YouTube, the visualized data shows that Google is actually losing money with YouTube. While it earns around $8,232 in ad revenue, YouTube eats around 13,068 per minute in maintenance. Outside of tech companies, the site has some interesting visualized data about McDonalds. Per minute, McDonald sells around 4,650 hamburgers, 1,769 Big Macs, and 6,458 pounds of fries all serving around 50,231 customers. Surprisingly, McDonalds brings approximately the same amount of revenue as Facebook in the same amount of time, $49, 937 per minute.